In my latest interview with Jim Goddard, I explore how insiders are behaving during this period of transition as the Fed moves to tighten financial conditions after a decade of easy money. Based on our indicators, there are a few bright spots in North America, but generally the insider response to the market correction has been tepid. 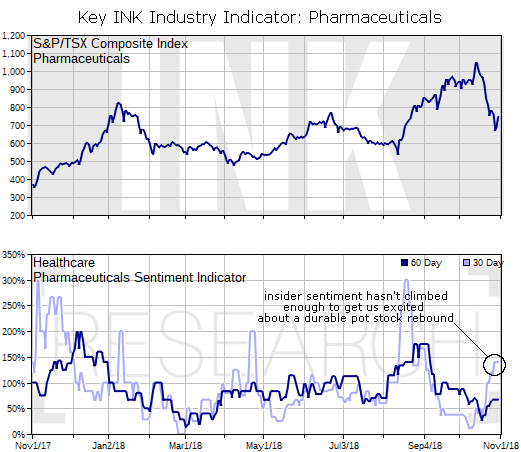 INK's Pharmaceuticals Industry Indicator in the Canadian market provides a window into what insiders are doing in the cannabis space as this is the industry where Thomson Reuters places many of the marijuana growers and distributors listed in Canada. 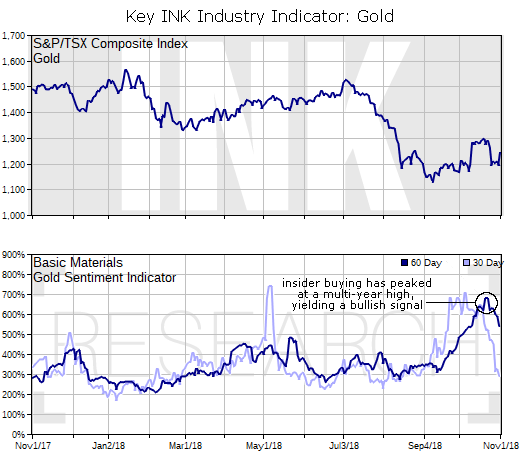 As we explained in the October INK Gold Top 20 Stock report, the 30-day version of the Pharma Indicator has had the most success in identifying turning points in the cannabis group. When the indicator peaks above the 150% level, it may mean that a significant level of support has been established for stocks in the group. At this point, we have yet to see the indicator move beyond 150%, nevermind peaking. Consequently, based on our indicator we believe the recent rebound in pot stocks may not be very robust. Higher interest rates are serving as a key headwind for cannabis stocks at these levels as the cost of waiting for the group to turn a profit is getting more expensive. Right now, stock selection is key in order to identify the companies with the winning strategies and management teams to overcome the waiting game associated with realizing eventual profit opportunities. As part of that effort, we would keep an eye out for stocks with recent insider buying and bright INK Edge outlook rankings. Stock selection is also the name of the game in the Energy sector which has seen a disappointing insider reaction to the recent pullback in stock prices. While insiders continue to signal that medium-term value exists in the Canadian oil patch, they are also telling us that risks are rising for the group on a short-term basis. The gold group remains one of the more exciting areas of the market based on insider signals. Our Gold Industry Indicator is moving off a multi-year peak which serves as a bullish signal. Insiders seem to be betting that gold will do well if either the Fed is too slow or too fast in raising rates. If they move too slowly, inflation could get out of control, while if they move too quickly the economy could flip into recession, and we would be heading for a zero-rate policy again. The big risk for gold will be if the Fed gets it right and is able to tighten at a pace that is just right and the economy booms. So, in two out of three Fed scenarios gold stocks should do okay. In mining stock investing, two out of three odds ain't bad. Meanwhile, Financials are the big wild card. 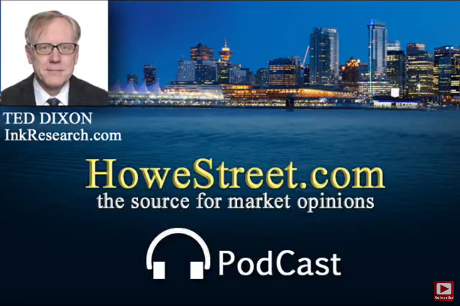 We have seen insider sentiment in both Canada and the U.S. improve during the sell-off. This is an encouraging sign. However, we have yet to see peak insider buying which means we have to allow for the potential that stock prices in the sector could continue to go lower. Moreover, buying among the defensive REITs group is helping to boost the sector's insider sentiment. Of all the sectors to watch going forward, the Financials is going to be the most important. With interest rates on the rise, it is hard to picture a durable stock market recovery without solid, broad-based participation from Financial stocks. If we see our US Financials Indicator peak around these levels over the next few days, it will support the bullish case for a market rally into year-end. 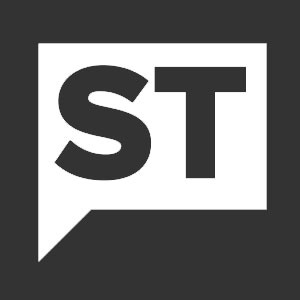 For INK subscribers and Canadian Insider Club members, we will update our read on the Canadian Financials Monday. On Wednesday, INK subscribers will get our update on the US sector.